From July through September, volunteers harvest fresh organic produce from our Plant-Grow-Share gardens, then set up at different locations in Central Neighborhood to share food with the community. Stop by for free food, to share recipes, and participate in fun, family-friendly activities! 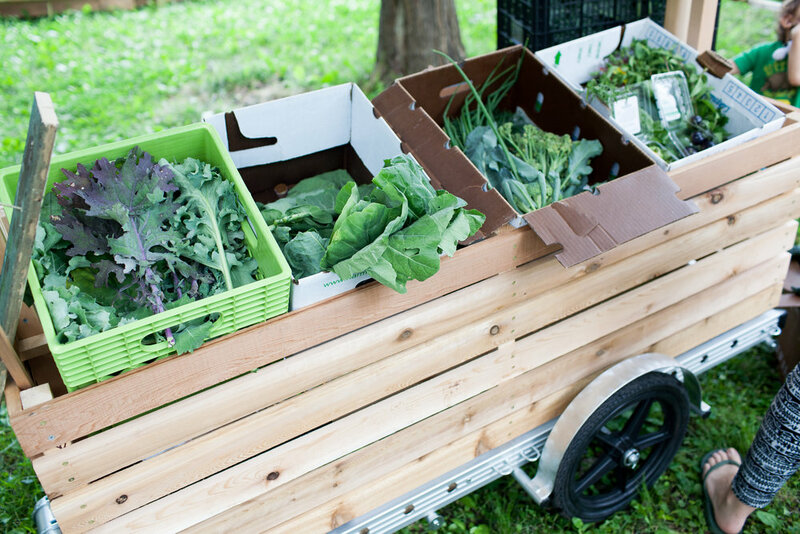 Get involved by harvesting produce for the market or biking the market around the neighborhood. See more information below! If you are aching to give back in your community, this opportunity will not disappoint you. Rise early, bring your own bike, and ride along side 2-4 people from garden to garden to harvest organic produce grown by people participating in PGS. You can volunteer as little as one time and as many as 10 distribution days through the Summer, July to September. We meet and bike along side the Little Free Farmers Market bike mobile to gather food to give away. This is a great opportunity to share with the community the importance of food sovereignty, how to grow organic food at home, and all the different ways in which PGS can support this goal. Distributions are at different locations in the neighborhood each week. Visit our Get Involved page to sign up to volunteer. Come help distribute the food grown by PGS volunteers! The Little Free Farmers Market makes its way through Central Neighborhood to give out free, organic produce! You can volunteer as little as one time and as many as 10 distribution days through the Summer July to September. This is a great opportunity to share with the community the importance of food sovereignty, the opportunity to learn to grow organic food, and all the different ways in which PGS can support them in that goal. Distributions are at different locations in the neighborhood each week. Contact us to get all the details and to sign up to volunteer. Don’t have your own bike? No problem! When you sign up to volunteer with LFFM distribution, you bike the market!